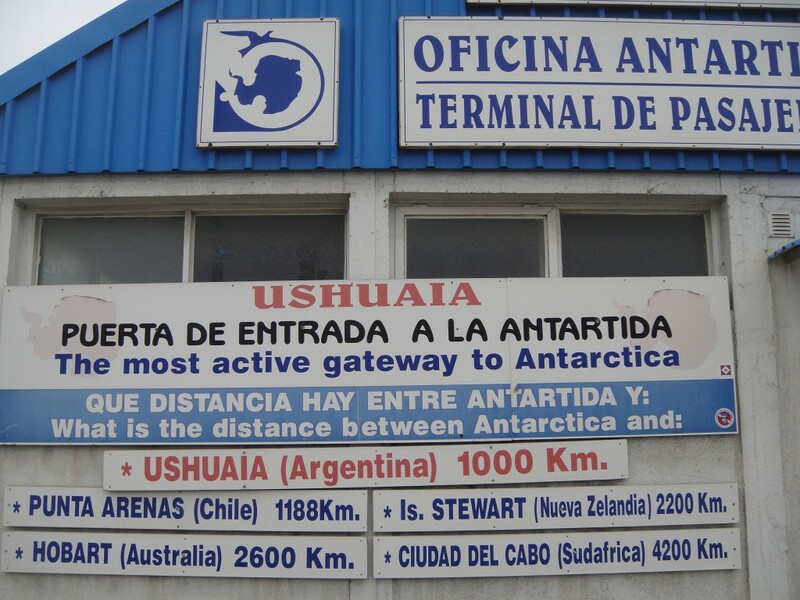 I arrived in Ushuaia on Superbowl Sunday of yet another 4 day long Argentinian holiday weekend. 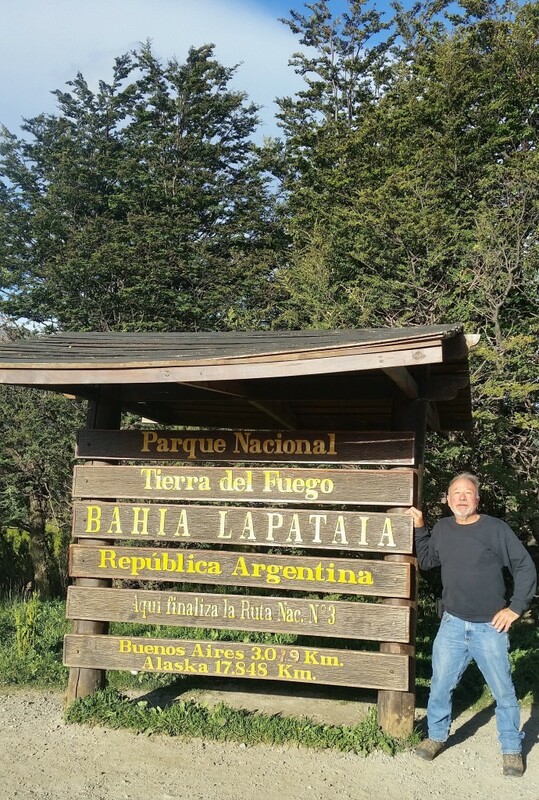 When I arrived the weather was nice, I drove the 24 km out to Tierra del Fuego National Park the end of Route 3 to the “fin del mundo” or “end of the world” sign to take a photo. The famous sign at the end of the road. I enjoyed a nice hike from the end of the road a couple of miles to Lapatia Bay, a small harbor that opens into the Beagle Channel. The Beagle was the name of the ship that brought Darwin to these parts. 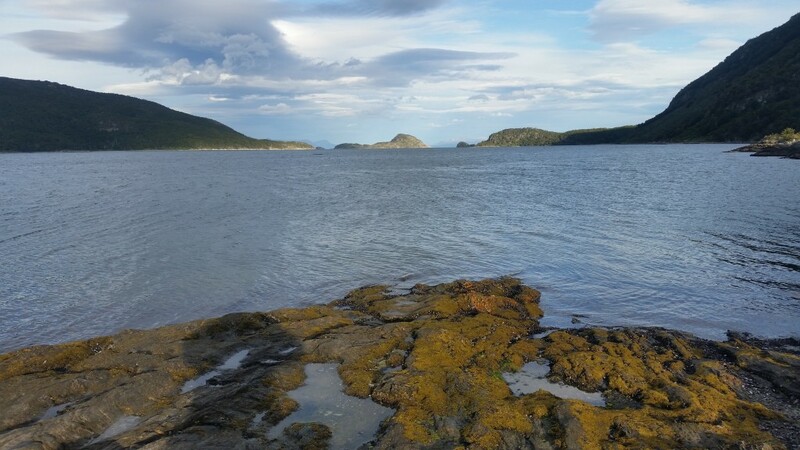 Photo of Lapatia Bay, the small opening in the center of the frame opens to the Beagle Channel. The channel separates the larger main island of Isla Grande de Tierra del Fuego from various smaller islands of the archipelago. Darwin had his first sight of glaciers when he reached the channel in 1833, and wrote in his field notebook “It is scarcely possible to imagine anything more beautiful”. I considered camping in the national park but after several days of wild camping I wanted a hot shower. I went to the last private campground still open in Ushuaia but soon to close, “Camping Rio Pipo”. The great room at Camping Rio Pipo, containing two wood stoves and Satellite TV. Camping Rio Pipo was closed at the end of last season. Luckily for me they decided to re-open again until they will close permanently at the end March. Competition from the free camping in the National Park has taken a lot of the business away from the private campgrounds. Camping Rio Pipo is a nice campground with a large common room with two wood stoves that the owner made himself out of cast iron water pipes. Also a large screen satellite TV, perfect for tonight’s super bowl game. The weather outside has turned nasty and it has started to storm, wind, cold and heavy rain. 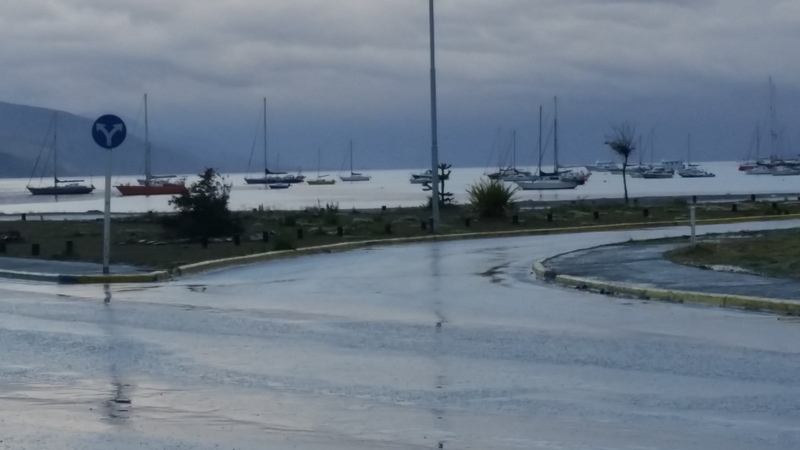 On the rainy waterfront in Ushuaia. On the way south I stopped at the propane company in Rio Grande, a large city about 225 km to the north. The guard told me they would be closed until Wednesday. I was headed next to Chile where gas fittings are different and incompatible with my tanks. I wanted to fill up while still in Argentina. I would spend the long weekend until Wednesday comfortably in Ushuaia in spite of the weather. I would spend a couple of days at the museums of Prison and Maritime history. The city of Rio Grande is very cold, located right on the south Atlantic coast where the wind is ferocious. Since there is no commercial campground in Rio Grande, I will spend the weekend here in Ushuaia. 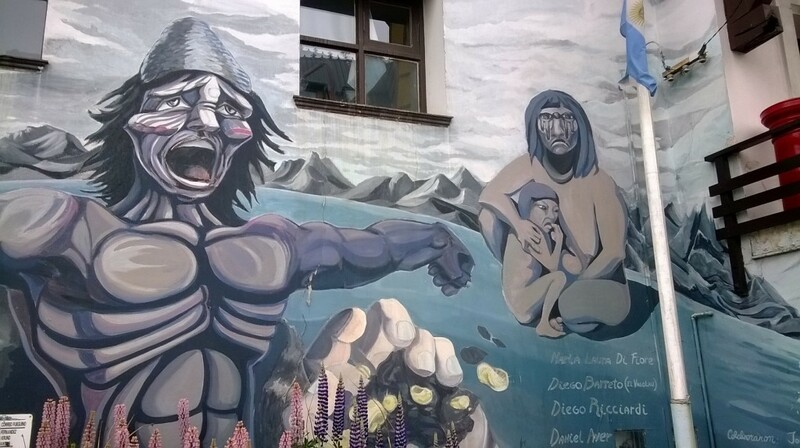 Native inhabitants depicted in a street mural in Ushuaia. Native inhabitants had lived in Tierra del Fuego for 10,000 years. Ushuaia was founded and named informally by British missionaries in the latter half of the 1800s. The British ship HMS Beagle, under the command of Captain Robert FitzRoy, first reached the channel in 1833, during its maiden voyage surveying Tierra del Fuego. In1885 the territory of Tierra del Fuego was formed and Ushuaia was named its capital. 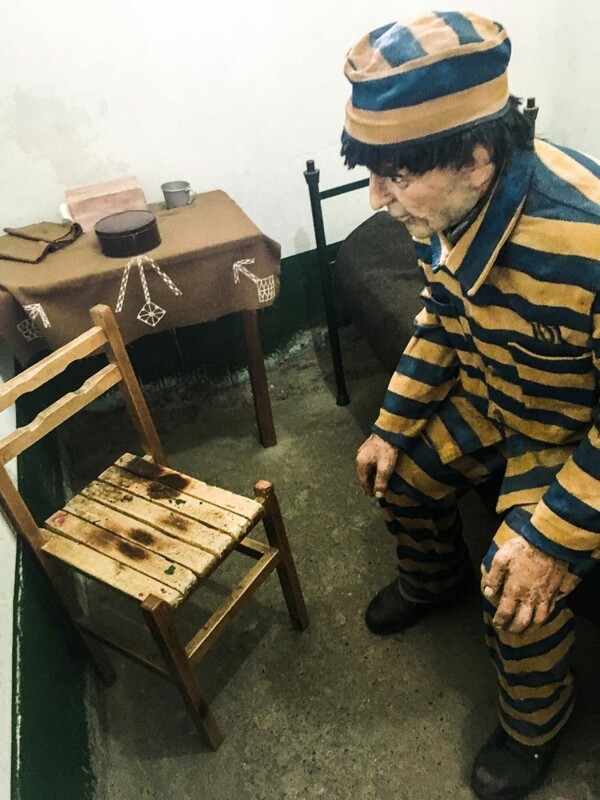 One of the hundreds of exhibits at the Prison Museum in Ushuaia. The figure looked so real I thought it may have been an actor until I touched it. 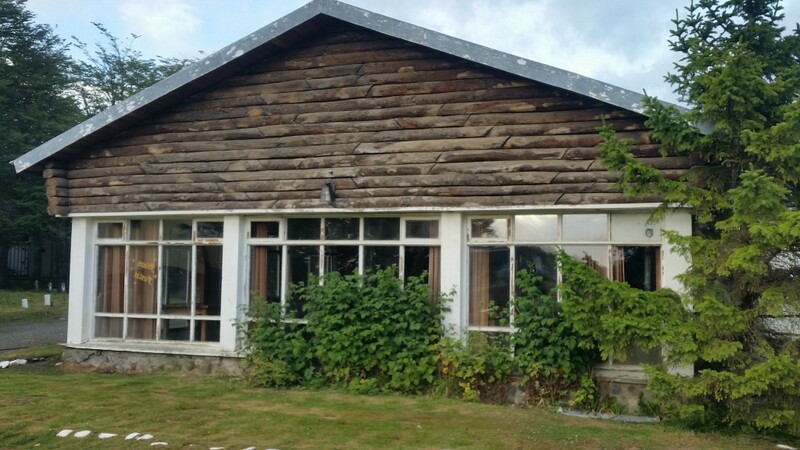 In 1896 Argentina created a prison and penal colony in Ushuaia, mainly for re-offenders and dangerous prisoners transferred from Buenos Aires, but also some political prisoners. The prison still stands today as a museum. During the first half of the 20th century, the city and activity around the prison increased the Argentine population. The intention was to ensure Argentine sovereignty over Tierra del Fuego. Antarctic passenger terminal, at the harbor in Ushuaia. The prison followed the example of the British in Tasmania and the French in Devil’s Island. Escape from Tierra del Fuego was similarly difficult, although a few prisoners escaped most returned eventually seeking food and shelter. Only one political prisoner was known to have permanently escaped and he had outside help and a ship waiting for him. The prison population thus became forced colonists and spent much of their time building the town with timber from the forest around the prison. The prison operated until 1947, when President Juan Perón closed it by executive order in response to the many reports of abuse and unsafe practices. 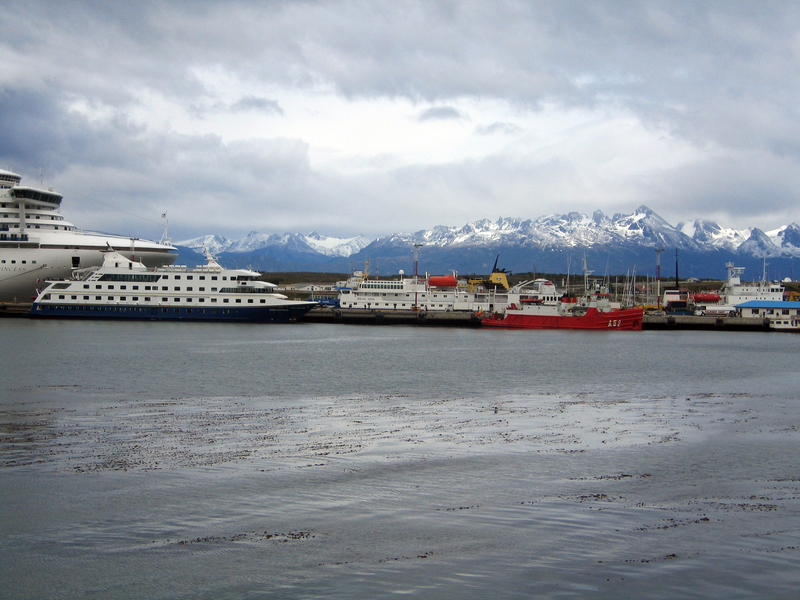 There is a large Grundig factory and very active port, but Ushuaia is known mainly as a tourist destination for adventure tourists and a staging ground for cruise ships offering trips to Antarctica. Several ski areas are located near Ushuaia including Cerro Castor. Opened in 1999, Cerro Castor is the southernmost full-fledged ski resort in the world. On Cerro Castor, it is possible to ski just 660 ft above sea level. The summit reaches an elevation of 3468 ft. Consistently cool temperatures allow the longest skiing season in South America. Several scenes in the 2015 film The Revenant, directed by Alejandro González Iñárritu, were shot in Ushuaia. 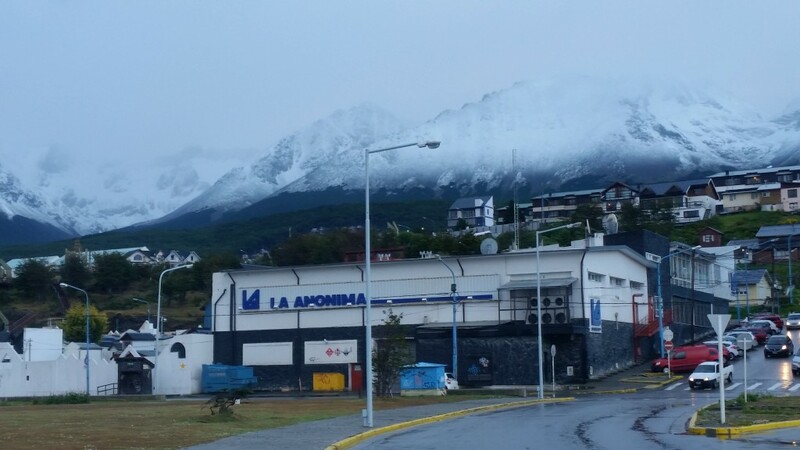 It is very cold and wet in Ushuaia today. The snow level almost reached sea level as seen on the nearby hills. It is supposed to be summer. My neighbors at the campground a nice couple from Germany. 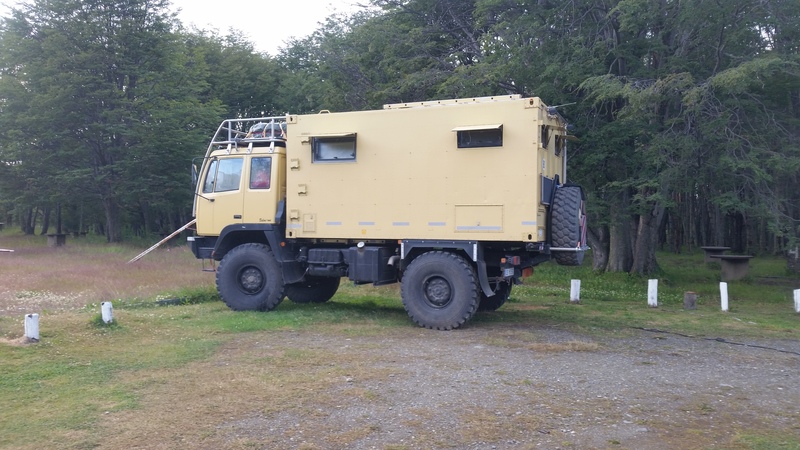 I see many of these huge overland vehicles, usually owned by Germans, touring South America. Previous Previous post: Where Am I Now?